When it comes to iPad keyboards, Logitech’s $100 Ultrathin Keyboard Cover has been among our favorites since it debuted for the standard iPad in early 2012. If you’ve been pining for a smaller version for your iPad mini, the wait is over: On Tuesday, the company announced the $80 Ultrathin Keyboard mini. Like its full-size sibling, the Ultrathin Keyboard mini is a Bluetooth keyboard housed in an aluminum shell, but this time the shell is sized specifically for the iPad mini. When you’re not typing, a magnetic hinge along the back of the keyboard attaches to the edge of your iPad mini—Smart Cover-style—letting the keyboard shell double as a rigid, protective cover for the iPad’s screen. When you're ready to type, you detach the keyboard from your iPad mini and insert the tablet into a groove in the Ultrathin Keyboard, which acts as a stand. Despite the smaller overall size, Logitech says the Ultrathin Keyboard mini uses the same full-size keys as the original version, along with a standard key layout. 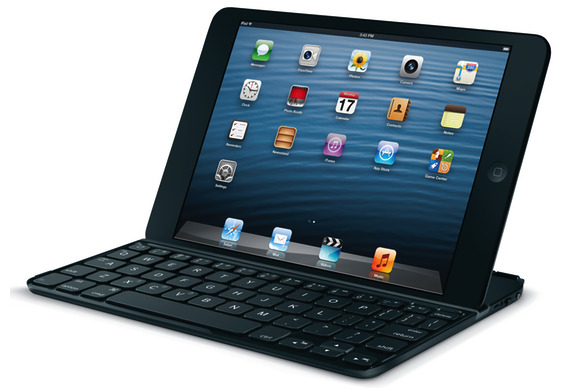 Based on images of the mini version (shown above) that Logitech provided to Macworld, it appears the company was able to preserve full-size letter keys by using smaller versions of keys such as Return, Shift, and particular punctuation characters, as well as by omitting keys such as Tab and Caps Lock. Compared to the standard Ultrathin Keyboard, the mini version also uses shorter keys in the top (number) and bottom (spacebar) rows. Available in black or white, the Ultrathin Keyboard mini charges via USB, and Logitech says a full charge can power the keyboard for three months of two-hours-a-day use. The accessory is scheduled to ship later this month.